Our native goldenrod should be a more popular garden plant. Given its value to wildlife, it should have rock star status. The reason it doesn’t is due to mistaken identity, which has given the plant a bad rap. People blame goldenrod for their late-summer allergies: allergic rhinitis, better known as hay fever. But the bright, showy flowers that look like exploding fireworks aren’t the culprits. That would be ragweed, Latin name Ambrosia, which blooms at the same time and often nearby. 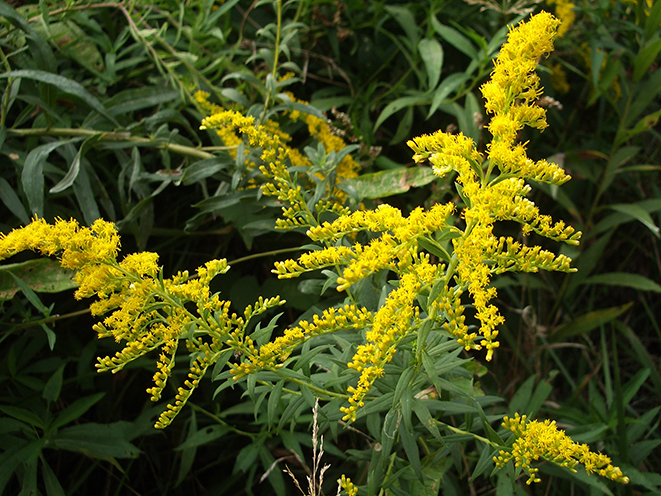 It’s a tall, dull-green plant overshadowed in late-summer fields and byways by goldenrod’s sunny brightness. Ragweed pollen is what sets off people’s allergies. It’s light and dusty and carried by the wind to nearby eyes and noses. Goldenrod’s pollen, on the other hand, is too heavy to become airborne. Which is just how insects like it. The over 50 species of goldenrods (Solidago sp.) are champion pollinator plants, sustaining a remarkable 115 species of butterflies and moths in the mid-Atlantic region alone, according to University of Delaware professor Douglas Tallamy, author of the book Bringing Nature Home (Timber Press). For comparison, the popular black-eyed Susan (Rudbeckia) attracts about 17 species of butterflies and moths. And not only butterflies and moths depend on goldenrod. The list is lengthy, including long- and short-tongued bees, honeybees, bumblebees, little carpenter bees, sweat bees, plasterer bees, wasps, flies, beetles, and ants. Some insects eat the leaves or lay eggs in the stems. But the draw for most is the nectar and pollen so critical for getting through the winter. Some birds, such as chickadees, eat the seeds. So if you really want to help wild creatures, don’t cut down the goldenrod growing on your property. In fact, plant more if you can. Goldenrod is easy to grow where there’s full sun. Plants don’t need rich soil, but do need soil that is moist. Compact and attractive goldenrod varieties are available to share the spotlight with asters, Joe-Pye weed, and other fall-blooming flowers. ‘Little Lemon’ only reaches 12 to 18 inches tall and wide, and can grow in a container. Long-blooming ‘Fireworks’ really does look like horticultural pyrotechnics, with 3-4 foot stems sparkling with blossoms. ‘Peter Pan’ comes between the two, height-wise, topping out at around 28 inches.